In my last blog I tried to show that there is a connection between broadband diffusion and real download speeds. At first glance this sounds trivial given that broadband is defined by transmission speed. But it is actually not that straight forward. In emerging broadband markets download performance will improve only marginally because ISPs add new customers at a pace faster than backhaul capacity increases. Offering mediocre performance at a relatively high rate is the curse of supply driven markets. Once the inflection-point of s-shaped broadband technology adoption is reached the amount of new customers joining the crowd each year is decreasing. Ideally the market is becoming now more mature so that several ISPs compete for increasingly picky customers. Hence in a competitive market ISPs will continue to invest in backhaul capacity despite narrowing profit margins. And this is where speed-performance suddenly gets a boost. 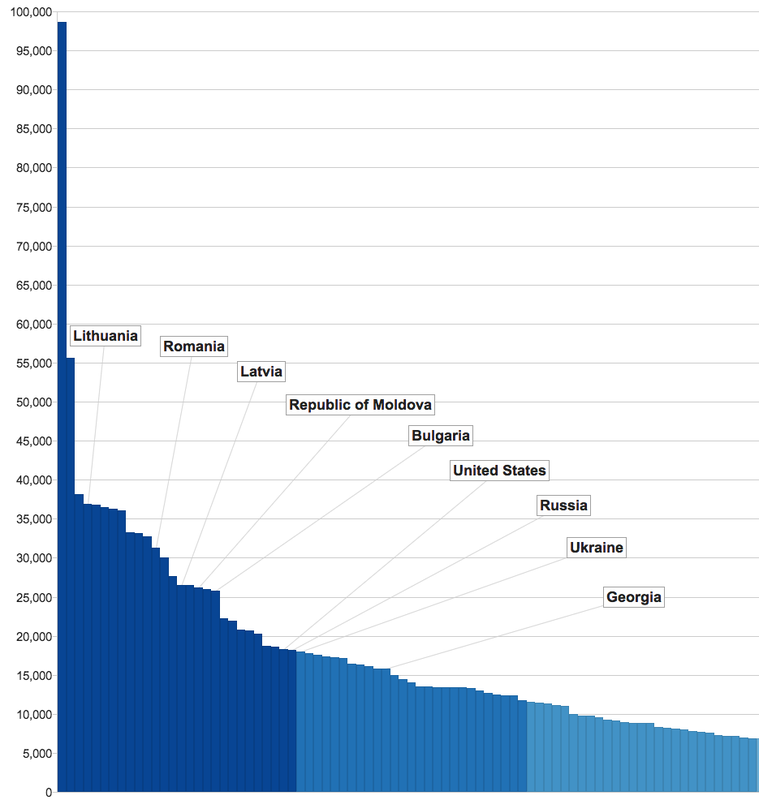 The chart below shows real download speeds in the BRICs and three reference countries Sweden, the US, and the UK. Sweden leads and Russia caught up with the US and the UK. China, India, and Brazil remain below the world average. Russia succeeded in in boosting download speeds despite the country’s badly evaluated ICT policy (the World Economic Forum ranks Russia as no. 106 out of 144 countries). In my last blog I argued that Russia performs better because, in contrast to the rest of the BRICs, it already passed the turning point from a supply-driven towards a demand-driven market. But there is of course more to it. Cloud computing and the Internet of Things make it necessary that we re-imagine and reengineer the digital world as bi-directional exchange of information. We do not only use more data, but we also contribute more. Consequently upload speeds are becoming more important for full-fledged virtual experiences. And here the world seems to severely challenge the conventional digital pecking order. Russia outperforms Sweden. And China’s upload speeds are better than those of the US and the UK. This raises the question: Do upload speeds follow a logic that is different from download speeds? To answer this puzzle, I first would like to bother you with some technological details. For many consumers (and in particular social scientists) it comes as a surprise that we are not all connecting to the Internet with the same technology. There is a whole bunch of possibilities but three of them are dominant for fixed line connections: DSL, (coaxial) cable, and, (optical) fiber. The majority of fixed broadband connections in the world are based on DSL (digital subscriber line) technologies. DSL is cost efficient because it uses existing copper wires of basic telephone connections. Typical data rates for current applications are 5-10 Mbps. The predominant standard is ADSL (asymmetric DSL) where most of the spectrum is used for down streaming and relatively little spectrum is allocated for up streaming. This makes ADSL not very attractive for two-way applications such as cloud computing or video conferencing. DSL has the disadvantage that data rates decrease the further the connection is located from the telephone exchange. A second impairment is ‘crosstalk’, which means that signals from one copper pair interfere with signals from a neighbouring line. Yet, DSL technologies still entail much potential (fiber to the node to mitigate the distance problem and vectored DSL to filter crosstalk) and more recent developments suggest that speeds of up to 100 Mbps are theoretically possible. The second mainstream technology is cable. Cable networks are usually fed by fiber; close to the home, data is further carried through copper coaxial cable. All households connected to a fiber line share the available spectrum. Thus upload and download speeds depend on the number of connections and the amount of data that users are seeking to transfer at the same time. Virtually unlimited data capacity provides FTTH (fiber to the home) where a splitter in the telephone exchange connects usually 32 homes with one fiber line so that there are 3000 GHz dedicated to each subscription line. Exhibit 1 shows that pure fiber networks are a major step forward for building fast-speed Internet access in the digital economy. Even though FTTH provides the best performing data transmission approach technology choices are made under budget constraints and thus entail an evaluation of costs and perceived benefits. Costs in turn dependent on existing technology regimes; that is to say technology switching costs might be substantial compared to a new installation. DSL technologies, for instance, are dominant in most European nations simply because it is cheap to use existing phone-lines. The UK is a typical DSL dominated market even though there are also cable-based ISPs with a market share of about 20 per cent. Also due to historical reasons the most important broadband technology in the US is coaxial cable. 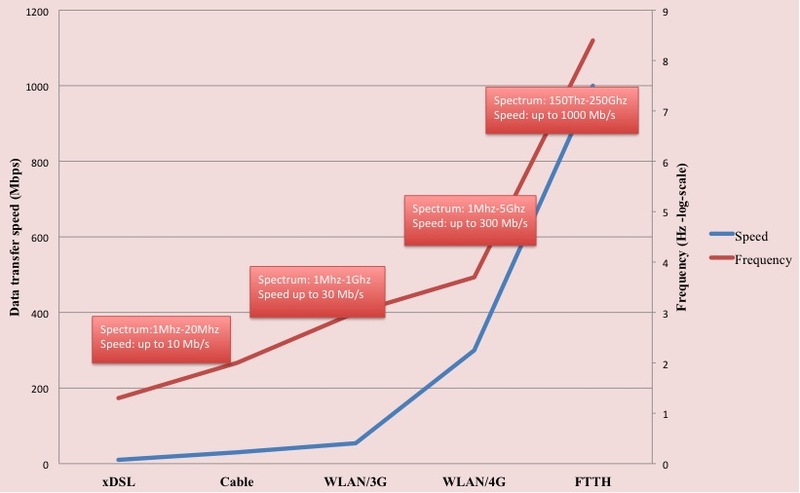 The charts on download and upload speeds suggest that cable and DSL technologies provide in practice quite similar performance results. Sweden, by contrast, stands out because it introduced already in 2000 a broadband strategy with the aim to alter the nation’s technology path. To this end a lot of tax payers’ money went into communal fiber networks that operated next to -, or in cooperation with commercial operators. As a result 35 per cent of Swedish homes already now have Internet connections that are in line with the European concept of Next Generation Access (NGA) networks (European average is 20 per cent). The difference between Sweden and the rest of Europe becomes even more striking at the top-end. Almost 25 per cent of all Swedes use so-called ultra fast connections (at least 100 Mbps) as compared to 3.4 per cent in the European Union. But why is Russia performing so well in terms of speed? The answer is the same as in the case of Sweden – fiber. Russia is one of the worlds largest markets for optical connections. But not due to political planning and government backed financial commitments. Instead it is a rising middle class in a few urbanities that caused the Russian “speed-miracle”. Nowadays there is a growing crowd of people in Moscow, St. Petersburg, and some other larger cities that is wealthy enough to abandon low-standard socialist dwellings in exchange for modern housing. Property development is booming in many East European, and Central Asian cities. About 25 per cent of all broadband connections in Russia are concentrated in Moscow, and St. Petersburg. In these rapidly expanding cities fiber can be rolled out cost efficiently. Adding fiber cable to new buildings is relatively cheap. The average installation cost per kilometre amounts to 4 per cent of the costs for installing water pipes compared to 2 per cent for copper wire or coaxial cable. Russia is not the only country that gets a speed upgrade as a consequence of a booming real estate sector. 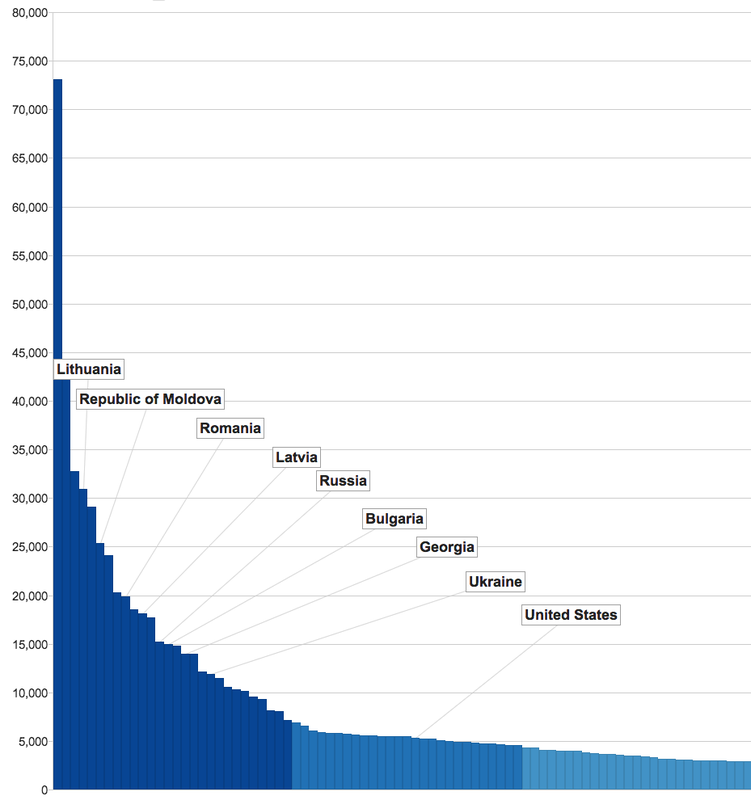 Or would you have expected that Romania, Bulgaria, and the Republic of Moldova are outperforming the US in terms of both upload and download speeds (see charts below)? The US’s ICT policy is ranked no. 20 worldwide and Sweden tends to be among the top-five. 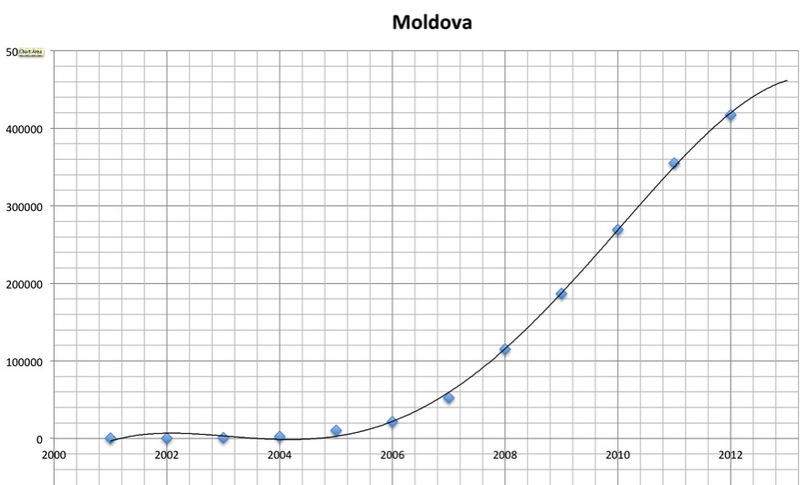 By contrast, the “speed-queen” Moldova is on rank 98, Romania on 88, and Bulgaria on 70. Should we conclude from this that policies do not matter? For the sake of being provoking and surprising I wish I could have ended here with and exclamation mark instead of a question mark. But I’m afraid I have some more charts. Look at the graphs below. 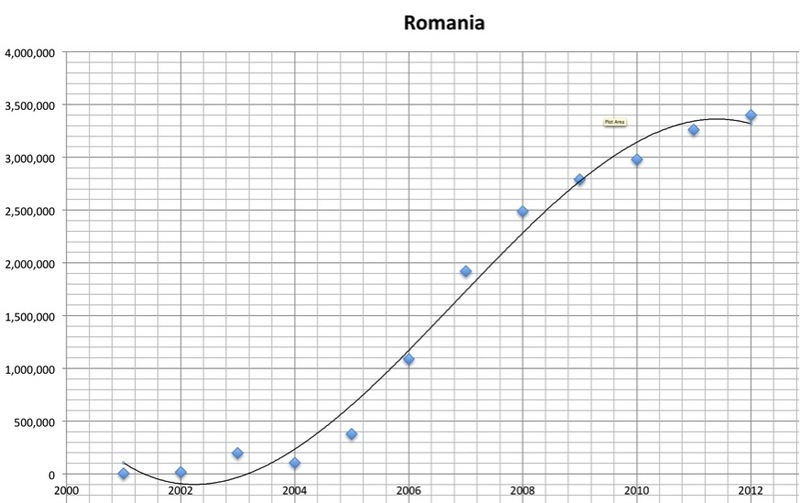 Broadband adoption in Moldova, Romania, and Bulgaria has not only slowed down but it seems that it is approaching market saturation (see the charts below); at penetration rates between 13 and 16 per cent. This is really sad and in my opinion the most important reason why governments need to get involved. Internet access is not only about watching TV on demand or playing online games. Internet access (and here I mean fast speed access) is about to emerge as a precondition to ensure equal chances for social and economic participation of all citizens. Neglecting 85 per cent of the population, therefore, will not only destroy opportunities for growth but, perhaps more important, it will reinforce social inequalities. Bad policies pervert everything that is exciting about the Internet – instead of enhancing democratic participation they promote steepening social polarisation. Let’s have a look at this from a global perspective. Below you see a scatterplot of the number of broadband connections per 100 inhabitants (x-axis) and a quality index for national ICT policies on a scale from 1-7 (y-axis; 1=worst; 7=best). The pink dots represent advanced economies; blue dots are Central and East European nations; green stands for the Commonwealth of Independent Nations, yellow is Developing Asia, and orange depicts Latin American and Caribbean states. Obviously there is a quite strong correlation between the quality level of ICT policies and the depth of broadband penetration. Now that I proposed that policies matter, it seems sensible to devote my next blog to the principles of broadband market regulation. In this context I’ll try to explain why the future of digital mobility is fixed and why LTE technologies could constitute a trap for economic development. Kim, Y., Kelly, T., Raja, S. 2010. Building broadband: Strategies and policies for the developing world. Global Information and Communication Technologies Department. Washington DC: World Bank, p. 48.